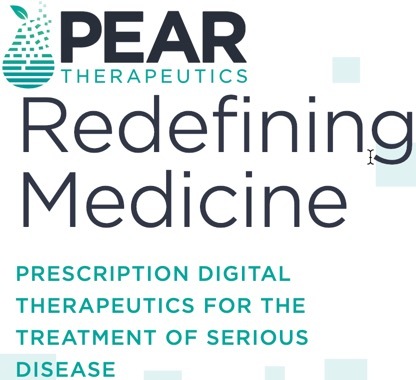 Pear Therapeutics, Inc., the leader in prescription digital therapeutics, today announced that it has successfully closed a $64 million Series C financing led by Temasek, and joined by other existing investors including Novartis, 5AM Ventures, Arboretum Ventures, Jazz Venture Partners, The Bridge Builders Collaborative, and Singapore-based EDBI. The round also saw participation from a group of new investors, including Blue Water Life Science Fund, LP., Trustbridge Partners, and a major diversified hedge fund. The financing will allow Pear to support the global commercialization of the reSET suite of products, fund the company’s clinical-stage pipeline, and opportunistically acquire additional assets. Launched in 2013, Pear focuses on the development of software-based disease treatments by using a biopharmaceutical approach. A prescription digital therapeutic, or PDT, is developed based on randomized clinical trials that generate clinical data to demonstrate safety and efficacy. Based on such data, market authorization from the FDA is sought to treat disease. PDTs are dispensed via a clinician’s prescription for use either alone or in combination with pharmaceuticals. They are designed to be reimbursed by insurance providers using pathways traditionally associated with pharmaceuticals and therapeutic medical devices. In addition to two FDA-authorized PDTs, Pear’s pipeline includes development-stage therapeutics across disease areas. Pear’s lead products, reSET and reSET-O, treat Substance Use Disorder and Opioid Use Disorder, respectively. Pear and its commercial partner Sandoz Inc., a division of Novartis, announced the commercial launch of reSETin November 2018. In December 2018, the FDA granted marketing authorization to Pear for reSET-O. reSET-O was the first PDT to receive Breakthrough Designation by the FDA and is intended to be used in conjunction with buprenorphine and under clinical supervision. Pear Therapeutics is the leader in Prescription Digital Therapeutics or PDTs. We aim to redefine medicine by discovering, developing, and delivering clinically validated PDTs to provide better outcomes for patients, smarter engagement and tracking tools for clinicians, and cost-effective solutions for payers. Pear has a pipeline of products and product candidates across therapeutic areas, including severe psychiatric and neurological conditions. Our lead product, reSET®, treats Substance Use Disorder and was the first prescription digital therapeutic to receive marketing authorization from the FDA to treat disease. Pear’s second product, reSET-O™, for the treatment of Opioid Use Disorder, received marketing authorization from the FDA in December 2018. For more information, visit us at www.peartherapeutics.com.